Men’s basketball may be done for the season, but women’s basketball is far from it. The No. 1 seed Cardinals played the opening game of the 2019 Big Dance in typically dominant fashion. Louisville (30-3) routed No. 16 Robert Morris (22-11) in the first round of the NCAA tournament. The Cards won 69-34 and move on to face the winner of No. 8 Michigan/No. 9 Kansas State this Sunday, March 24 at the Yum! Center. The Robert Morris Colonials scored four points in the first two minutes of the contest, then failed to score the rest of the first quarter. The Cardinals led 21-4 at that point and controlled every aspect of play on the way to victory. 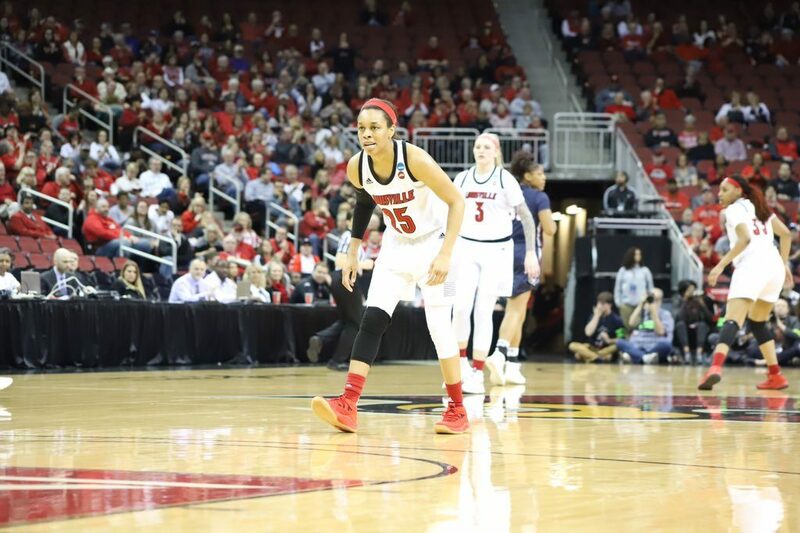 Seniors Asia Durr and Sam Fuehring led the way with 19 points each. Fuehring shot a perfect 9-for-9 from the field and posted a double-double with 11 rebounds. Sophomore Dana Evans followed with fantastic minutes at point guard, scoring 13 points with six rebounds and five assists. Junior Bionca Dunham scored 10 points with seven rebounds. Fuehring and fellow senior Arica Carter, both injured during the ACC tournament, are good to go for the NCAAs. Carter sat the bench against Robert Morris, her knee still wrapped from a strain, but should play upcoming games. Freshman Mykasa Robinson took Carter’s place in the starting lineup. Head coach Jeff Walz was absent from the sidelines because of a one-game postseason suspension. Louisville’s leader directed inappropriate comments, including “profane language”, toward NCAA staff at the 2018 Final Four. Associate head coach Stephanie Norman guided from the sidelines against Robert Morris. Walz will return for Louisville’s next game. Walz has a solid staff a veteran coaches, so Carter said the team was good to go for the first round. She spoke true, as Louisville shot 48 percent from the field with 46-28 advantage in rebounding and 36-12 edge in the paint.